NOW ON VIEW! The Wyckoff House Museum is thrilled to present a culminating exhibition of work by our 2017-2018 Artist-in-Residence, Iviva Olenick. Iviva’s residency permeated many aspects of our cultural organization. She worked closely with our garden team to cultivate dye plants like indigo, and process textile fibers from flax. She participated in many education programs, including a partnership with Midwood Active Adult Center, our Teen Apprenticeship Program, Teen Thursdays, and public programs. Her work was influenced and inspired by objects and documents found in the historic house and its archives. Her work, alongside two pieces by her students from Midwood Active Adults, were included in the 2018 exhibition Nou La–We Reach, presented by the Brooklyn Arts Council and curated by Desiree Gordon. Her residency exemplifies the exciting potential that artist collaboration can offer to idiosyncratic sites like the Wyckoff House. Iviva’s artworks, created during this year-and-a-half residency, interrogate and expand the narrative of this small Dutch farmhouse. Her work elegantly weaves together the stories of the many generations of immigrants, colonists, migrants, and residents of the surrounding area. She does not shy away from interrogating both the consonance and dissonance of the diverse peoples and stories that have inhabited this home and this land. 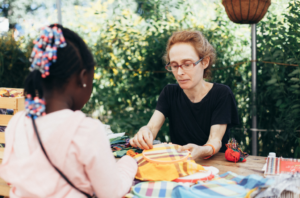 We invite you to use her textile-based artworks, alongside those presented by some of her students, as a new lens through which to view the Wyckoff House and our collective histories. The residency and exhibit are co-curated by Iviva Olenick and Melissa Branfman. Meet Iviva below. With support from the Brooklyn Arts Council and the New York City Department of Recreation’s Art in the Parks, we are excited to present the site specific fence weaving by Mildred Beltré and Oasa DuVerney of Brooklyn Hi-Art! Machine. Photo by Michael Piña. With our weaving we wanted to address multiple narratives around migration and immigration as well as address the the history of Brooklyn as a site of settler colonization. The woven message Stories Tell Of Loss Each New Land Allows New Dreams acknowledges the Indigenous population that lived in Brooklyn and how that history exists alongside the story of early Brooklyn migration and the stories of the current immigrant populations in Brooklyn. The Artist-in-Residence Program at the Wyckoff House Museum is a unique opportunity for contemporary artists to consider and respond to the history of early New York through the narrative of the Wyckoff House, one of New York’s oldest, now situated in East Flatbush, a primarily Caribbean community today. Currently, we are not accepting applications for artist-in-residence positions. Due to limited resources, the AIR program is currently by invitation only. Meet Iviva Olenick, our 2017-2018 Artist-in-Residence. 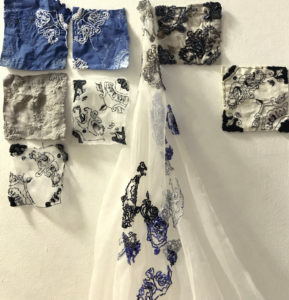 Iviva is a Brooklyn-born and based artist and educator with a BA in French Literature and Psychology from Binghamton University, and an AAS in Textile/Surface Design from FIT. She exhibits her work with Muriel Guepin Gallery, NYC and Brooklyn Workshop Gallery, Brooklyn. Her work has appeared at the Philadelphia Museum of Art, the Sugar Hill Children’s Museum of Art and Storytelling, NYC; Brooklyn Arts Council; the Center for Book Arts, NYC. Iviva is an educator for the New Museum, the Studio Museum in Harlem, Hannah Senesh Day School, the Center for Arts Education, Rush Philanthropic Arts Foundation and UrbanGlass. Supporting partners have included Brooklyn Arts Council, Humanities New York, New York City Parks and Recreation, The New York City Department of Cultural Affairs in partnership with Council Member Alan Maisel, Dutch Culture USA, the Consulate General of the Netherlands in New York, the Netherland-America Foundation, the Historic House Trust Contemporary Art Partnership. Program partners have included Caribbeing, Textile Arts Center, Weaving Hand, Made in Brownsville, Suede Restaurant, Footprints Restaurant, ShorBlu Events.